Ireland will be consulted on any offer put forward by the UK. President of the European Council, Donald Tusk meets with Taoiseach Leo Varadkar at Government Buildings in Dublin. EUROPEAN COUNCIL PRESIDENT Donald Tusk has said that if the UK’s Brexit offer is unacceptable to Ireland, it will be unacceptable to Europe. The EU chief visited Dublin today for talks with Taoiseach Leo Varadkar ahead of the EU summit, which he will chair, with the other 27 member States. 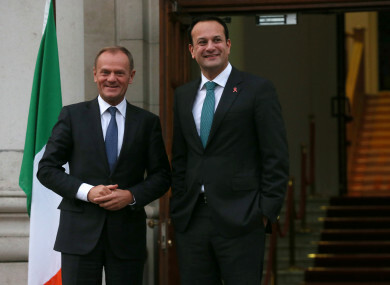 During a press conference this afternoon, Tusk said Ireland will be consulted on any offer put forward by the UK to deal with phase one issues – which include citizen’s rights, the Brexit bill and the border with Northern Ireland. He said such news will be “hard” for some British politicians to understand, but he said Ireland’s interests are Europe’s interests. “If the UK offer is unacceptable for Ireland, it will also be unacceptable to Europe,” said Tusk. Varadkar thanked Tusk for his unwavering support and solidarity with Ireland. Before the talks can progress to phase two trade talks the UK must make sufficient progress on the issues, including how it aims to avoid a hard border with Northern Ireland. While Varadkar said there has been progress made on EU citizen rights and the financial settlement, questions still hang over the border issue. “The best and most obvious solution” would be for the UK to remain in the Customs Union and the Single Market said the Taoiseach, but he acknowledged that this had been ruled out by Theresa May’s government. He said the onus was now on them to offer “credible” and “workable” solutions to prevent a hard border. “The period between now and the European Council meeting in two weeks time will be crucial. Indeed the next few days will be crucial. So we don’t have long,” said Varadkar. He added that with the right engagement, and being an optimist by nature, a solution is achievable. While he said he is willing to work intensively on the issue over the next few days, the Taoiseach is also willing to “stand firm” with Ireland’s European partners if the UK offer “falls short” on any of the three phase one issues. Earlier today, the Tánasite and Foreign Affairs Minister Simon Coveney said he wants to avoid the Brexit debate becoming an “orange versus green” issue in Northern Ireland. Former DUP leader Peter Robinson has accused the Irish Government of acting provocatively in the negotiations and said the South should “wind its neck in”. Yesterday, British media reported that the DUP threatened to withdraw from the confidence and supply arrangement that is propping up the British Government over the Irish border issue. Just one day into the job as Tánaiste, Coveney confirmed that he has talked to the DUP about the issues. However, he said the Brexit border talks are not a “green and orange” issue and have nothing to do with any clandestine attempt by the Republic to take back Northern Ireland. “I have tried and I continue to try to avoid this debate becoming a green versus orange issue in Northern Ireland – it is very hard to prevent that given the language we have heard, but our approach here is to listen to everybody. “No one party has a monopoly in Northern Ireland in the context of what is acceptable and what is not,” said Coveney. The minister said the Irish government will work with all parties to find a practical way forward, adding that he wanted to give assurances to the unionist communities in the North. “I can assure unionists that this is not some sort of tactic by the Irish government to progress some sort of constitutional change on the island of Ireland – quite the opposite. I am not going to get drawn into responding to comments by the DUP. We will listen to what everyone has to say in Northern Ireland regardless of where they come from, regardless of their community or their political party. The decisions we are trying to ensure are taken in terms of Brexit need to be in the interest of everybody on the island of Ireland. The Tánaiste said a Brexit deal on the Irish border question is “doable” but he said before that is possible there must be more movement and flexibility than has been seen to date. However he acknowledged that he believes “we can get to where we need to be in the next few days”. The Irish government’s position on Brexit is “stern and stubborn” but is fair, said Coveney, but he said he can not allow Brexit to drive communities apart. Coveney said the question of whether Ireland will use its veto to prevent the talks progressing to the next phase misses the point – stating that all the EU27 are behind Ireland’s position. “There is not an anti-British bone in my body – Britain is a great country and we want a good deal. A good deal for Britain is a good deal for us, but Ireland will not be steamrolled in this issue,” he said. On the border issue, Coveney said it is part of phase one and the UK has put nothing on the table in terms of a customs union. “I don’t mind what we call this, we can call it a customs union partnership, we can call it a grand trade partnership, whatever we want to call it – but the bottom line is if goods are going to have to move from one customs union to another then there will have to be customs checks somewhere, whether it is in a business premises or a borer, and we are trying to avoid that. I think we can avoid that in the context of the negotiations in phase two, I hope – but that is for a future date,” said Coveney. In terms of other issues that dominated the headlines this week, and whether the confidence and supply agreement between Fianna Fáil and Fine Gael has been damaged, Coveney appears to believe it is stable. Coveney said the confidence and supply arrangement is “robust” and he doesn’t agree that an election in the spring is inevitable. The new Tánaiste went so far as to claim the agreement with Fianna Fáil can last until the next budget. Email “'If UK Brexit offer is unacceptable to Ireland it will be unacceptable to Europe' - Donald Tusk”. Feedback on “'If UK Brexit offer is unacceptable to Ireland it will be unacceptable to Europe' - Donald Tusk”.